Customer lifecycle marketing (CLM) starts with creating the right thought process. I see too many retailers focused on optimising around conversions per website visit rather than the whole lifecycle. The key to success in CLM is behind optimising for Customer Lifetime Value (CLV) and not conversion rate (CR) or revenue per visit (RPV). This is not to say conversion rate does has its place - it’s a very important metric in the right scenario. However the hierarchy is what is important. CLV trumps all others as a metric for long term profitability. For those who are not familiar with the term, CLV can be defined as the total revenue received over the total lifetime of a customer. We are therefore optimising over the course of a customer’s relationship with your brand rather than at one point in time. 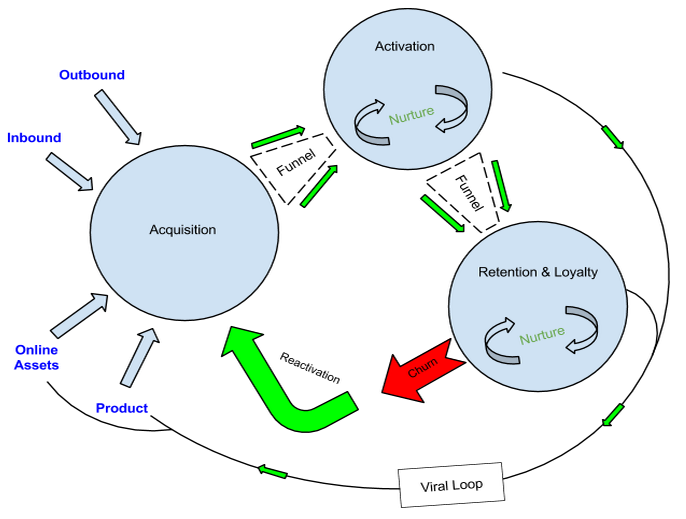 This leads on to the concept of the customer lifecycle machine which is made up of three different, but equally important, elements: Acquisition, Activation & Retention. These elements nurture and guide the behaviour of your visitors and customers in order to achieve specific goals, with the ultimate aim of increasing revenues based on maximising CLV. Throughout this process your visitors and customers will go through various stages of development, and understanding these stages is essential to creating the right sales and marketing machine. Before that, let’s have a quick break to see how important CLM is! 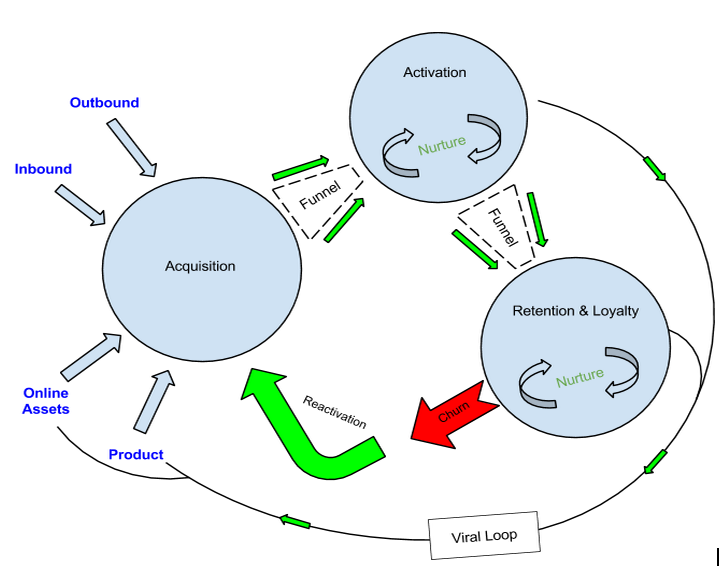 These are the core phases of evolution that will occur as customers are guided through your Customer Lifecycle Machine from a visitor to a loyal customer. Not everyone will advance through each progressive stage, many people will drop off in the process, however your goal is to get the best possible result at each individual step.I’ve developed a rather random analogy below, but it’s fun! 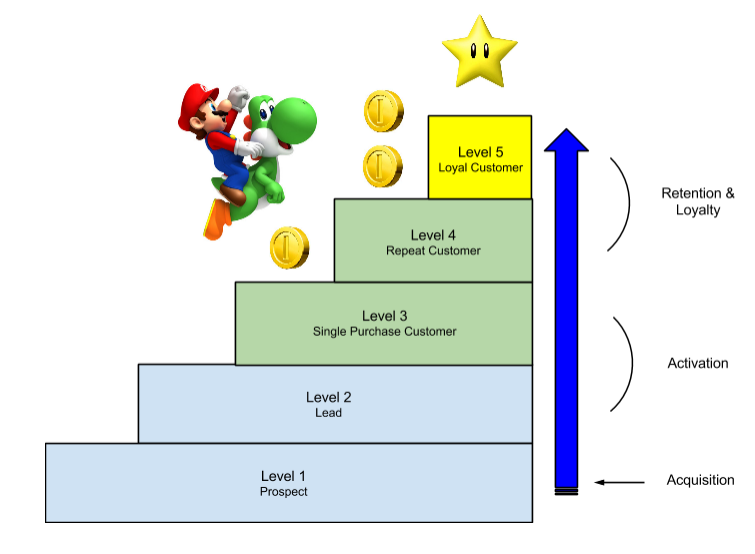 We’re going to brainstorm ways to ‘level up’ visitors and customers like Mario! Prospect - This encompasses all first time and repeat visitors who have not yet purchased from your online store or given you any details about them. I like to refer to this group as prospective customers, even though this may not be entirely true - someone could be visiting your job page for example. I believe it’s good practice to think of all your visitors as opportunities, as this encourages you to continually test new ideas to take advantage of these opportunities on a daily basis. Lead - Leads are prospects who have performed a micro conversion, such as signing up to your blog, and giving you some personal information in the process. The most important information to gather is the email address. This information can then be used to market to them after they have left your site, and depending on the information you gathered you should also be able to market to them in a more relevant way. This step is not a requirement en route to becoming a customer, but it is a method to optimise the ‘prospect to customer’ conversion rate through nurturing. Single Purchase Customer - Individuals who have completed their first transaction on your website. Repeat Customer - Individuals who have made more than one transaction with you but are yet to become loyal customers. Loyal Customer - Loyal customers will be defined slightly differently for different online stores. However as a guideline I like to say loyal customers are those that have completed more than 3 transactions, have been a customer for more than 6 months and have performed a transaction in the last x months. The x months should be relevant to your average sales cycle. To acquire the highest quantity of relevant visitors, who are new to your online store, in the most efficient way possible. Relevant visitors refers to individuals who are likely to be interested in your product - your target market. This goal will also include a profitability target which will be calculated by comparing the cost of customer acquisition (CoCA) per channel in relation to customer lifetime value (CLV). This target will be manipulated based on a business's current business model. If you are early stage and going through rapid growth you may be able to justify negative profitability on acquisition because the goal is simply to acquire customers until you reach a certain scale. Blog, Ebooks, Free tools, Social, SEO, PR, Videos, Email. Paid search, PR, TV ads, Paid Radio, Paid Print, Telemarketing. Product acquisition tactics revolve around building virality into your products. This is not easy to pull off and only works in specific cases, but it can be incredibly rewarding. Take Diamond Candles as an example. Their product spread virally through word of mouth due to the free diamond ring you received with every candle. The friends of customers often commented on the rings and were subsequently made aware of diamond candles.They made their product into a marketing tool. A viral loop directly related to buying a product....you can’t really ask for much better. Viral marketing built into your online assets: Website, Mobile site, App. A successful example of this is Gilt, whose ‘refer a friend’ scheme helped them to grow very quickly and get a big lead over their competitors. Primary Goal - To convert Prospects and Leads into customers. Secondary Goal - To convert prospects into Leads by gathering personal information such as their email, gender etc. After new users have arrived on your site it’s all about activation, which is the process of turning prospects and leads into customers. Many people think that you need to activate visitors into customers straight away with a macro conversion - i.e. a transaction - however I advocate using a more long term strategy. It’s important to understand that many people need to be nurtured into customers, and you will need to foster engagement through micro conversions before going straight for the sale. For example, people may need to learn the value behind your products and brand before converting. Try to focus on encouraging micro conversions that you know increase the likelihood of a prospect eventually becoming a customer. You can find this out through careful analysis of your customer behaviour data. It is also very important at this stage to obtain someone’s email address so that you have the ability to market to them at a later stage. Without that information you have no way of individually targeting those individuals again until they come back of their own accord - which of course many will never do! Highly targeted landing pages based on acquisition channel. Find the behaviour which caused previous customers to become a repeat customer and optimise your site for it. Convert repeat customers into loyal customers. Find the behaviour which caused previous customers to become a loyal customer and optimise your site for it. To minimise churn. By definition, if you are minimising customers who churn (become inactive), you are optimising for retention. The definition of a churned customer will be subject to your specific business. I normally define an inactive customer as someone who hasn’t purchased in a time frame that is 25% more than your average sales cycle. However if you have a product range with a large variety of different sales cycles you will have to find a better solution. It is far less expensive to prevent customers from churning in the first place, than to reactivate a customer once they have churned. It’s even more expensive to gain a new customer - It costs 5-6x more to gain a new customer than to keep an existing one. Your top 1% of customers can generate as much revenue as the bottom 50% combined. (RJmetrics). It is very beneficial to focus on engaging and nurturing your best customers. I typically define ‘best’ as the top 1-2% of customers by CLV. Have a high level employee phone them personally. Offer exclusive access to new products before they are on general release. Individually target rewards and offers. Invite them to a membership only club with benefits. Add handwritten notes to their purchases. Prioritise their orders when stock picking, to ensure they get them promptly. Empower & engage with evangelists - those individuals who have influence over relevant online and offline communities. Give them the tools necessary to promote your brand in order to encourage and easily facilitate word of mouth marketing. These customers have a tendency to only purchase when you offer steep discounts. It’s very important not to offer discounts too often, or too regularly, so as to prevent your customers become conditioned to always wait for the next deal. Having said that, there will always be price sensitive customers. Consider sending targeted offers just to this selection of people so you can obtain better margins from your less price sensitive customers. These individuals have a very high AOV value but purchase very infrequently. It is likely these individuals have a lot of disposable income. Send special promotions based on their purchase behaviour to try and gain a larger share of wallet. Nurture new first time purchasers into repeat purchasers when they are most impressionable. Utilise welcome/follow up emails, how to guides etc. This stage is a combination of targeted marketing efforts and customer service and brand development. A mix of highly targeted personalisation and promotions with helpful, interesting, and brand-building content. You need to continually optimise throughout the buying cycle and take care of your best customers. It’s all about customer segmentation. The ultimate goal would be for all your customers to be hero customers! However this defeats the point, as we know your hero customers are the top 1-2%. Therefore the goal is not to optimise for only hero customers, but for numerous different segmentations of valuable customers which make up your repeat and loyal customer base. Many customers will never become heros or evangelists, but enough will if nurtured properly. Optimise your average CLV by finding the behaviour, such as triggers and micro conversions, which funnel them towards your goals. Again this will vary wildly based on your individual business, however I’ve listed some key metrics below. Thanks for reading - f you enjoyed this post, please sign up to our blog or newsletter for more related content.